On March 22, 2013, an unlikely visitor was seen on the Lloyd Center property. 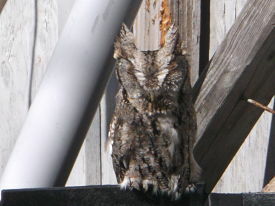 An Eastern Screech Owl (Otus asio) which was likely displaced by a significant late season snowfall that blanketed the region the night before, was roosting in the warm sun behind the old “goat shed” at the woodland edge. The owl sat motionless with its eyes nearly shut as the staff approached within feet of the bird. It finally opened its eyes and upon noticing us flew quietly into the nearby woods. Although screeches may be visible roosting during daylight hours, these sightings are infrequent due to their nocturnal habit, small size, and secretive nature. 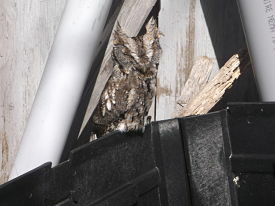 Screech owls are one of our most common owls but are rarely seen. Screeches can be found in nearly any wooded habitat close to a water source, ranging from urban parks to open forest. Owls are carnivorous, feeding on a variety of vertebrates and invertebrates, and have the most varied diet of any North American owl. Screeches are non-migratory, nest in cavities created by other birds such as woodpeckers, and readily accept nest boxes. Screeches are unique in that they are our only small-sized “eared” owl (saw-whet owls lack ear tufts), they have distinct relaxed and alert postures, have two distinct calls, and exist in both red and grey phases (grey most common in Northeast). Screeches respond readily to taped calls used for owl prowls.